We are a meat and potatoes kind of family. I would like to write that we are a vegetarian, kale-loving, green smoothie-drinking, salad with no dressing-eating kind of family. It sounds so fresh and healthy. But it's not true. We love meat. My kids, myself and my husband, especially my husband, all love a good steak. There is nothing better than a thick, juicy, perfectly cooked cut of beef. However, it's also one of those dishes that is reserved for special occasions, or at least a relaxing Sunday night. But sometimes we cheat. Sometimes we throw a steak on the grill on a Tuesday. This is our weeknight steak. 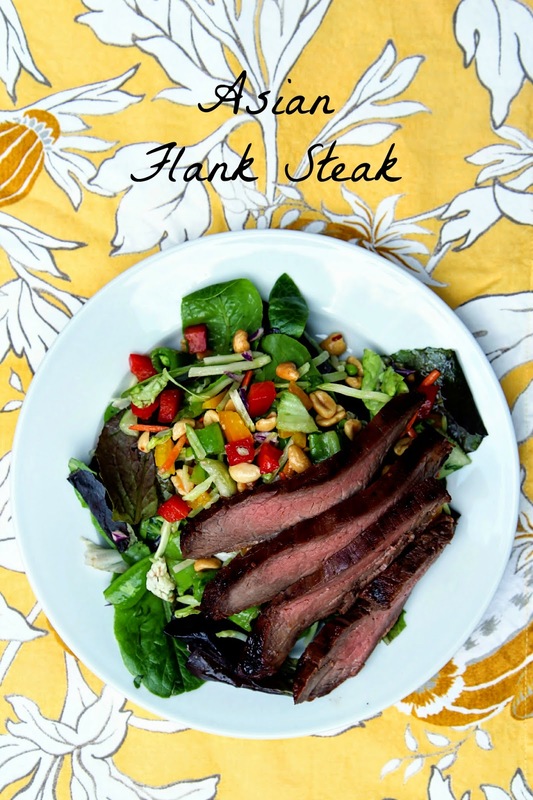 Flank steak is a lean, somewhat tough (i.e. less expensive) but flavorful cut of beef that benefits from the tenderizing effects of a marinade. My favorite marinades are a southwest-style marinade and a sweet teriyaki-style marinade. 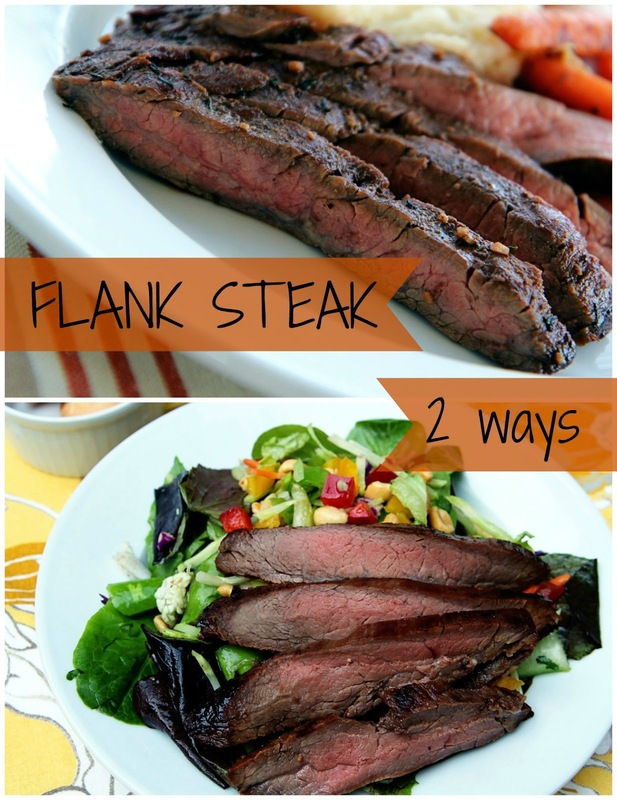 I've included my recipes for both below, hence Flank Steak 2 Ways! I like to buy flank steak 2 or 3 to a package at Costco, marinate them in a ziptop bag and throw them in the freezer for a great steak any night of the week! When flank steak is marinated, cooked quickly at high heat, and thinly sliced, it practically melts in your mouth. This recipe calls for grilling the steak, but if you don’t have a grill, you can prepare the steak on a large cast iron frying pan. 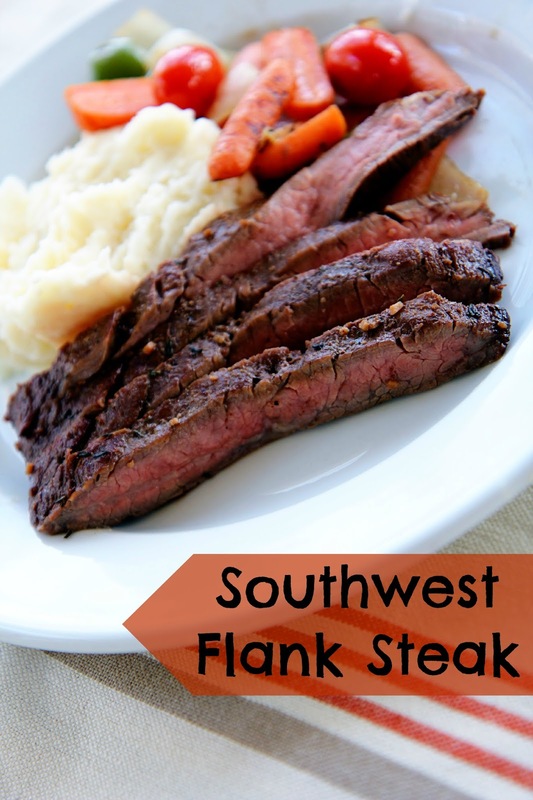 Southwest Flank Steak is smokey and slightly spicy with a touch of sweetness. Chili powder and cumin give it that distinct southwest flavor. Grill the steak for about 5 minutes on each side for medium-rare. Serve with grilled vegetables in an attempt to be more healthy. Slice the steak in thin strips against the grain. The Asian Flank Steak is prepared the exact same way. I like to live out my vegetarian fantasy by placing my beef atop a mountain of greens and colorful vegetables, much to the dismay of my carnivorous family. Mix the following marinade and pour over a 1.5-2 lb. flank steak. Freeze in a Ziploc bag. Thaw steak completely before grilling. Grill about 5 minutes on each side for medium-rare steak. The extra marinade can be brought to a boil, then simmered in a small saucepan. It can be used to drizzle on top of the grilled flank steak. Flank steak is best eaten medium rare; well done will make it too tough. When the steak has cooked to your preferred level of doneness, remove from the grill and place on a cutting board. Cover with aluminum foil to hold in the heat and to keep the steak from drying out, and let rest for 10 minutes. Thinly slice the steak against the grain. Serve and enjoy! for what it's worth- you make this look so easy and tasty that it makes this vegetarian tempted to make it for my boys!